These verb cards provide learners of all levels with an excellent way of learning and revising 100 French verbs in the present, perfect, imperfect and future tenses. The cards get them to practise the verbs in sentences in context, and immediate feedback is given, allowing them to learn and test themselves at their own pace. 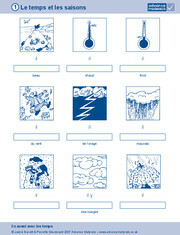 These cards will appeal to all learners, and will engage visual and kinaesthetic learners especially. Amusing illustrations, colour coding and the unique 'cut out card slide system' help learners to remember the verbs and tenses in context and to build up their vocabulary - and all in a wonderfully low-tech way! By means of the ingenious 'cut-out card slide system', learners move the front card up and down to reveal sentences illustrating each of the pictures in different tenses. Each card practises one particular pronoun.